Ever looked up and down Hampstead High street just utterly unsure on where to decide to eat? Same. Adding to their delicious menus: vegan, vegetarian, gluten-free and kids this makes Wagamama’s the ideal location for anyone looking to enjoy a wide range of divine Asian fusion let alone its new refurbishment with wishbone chairs! The wooden textures and gorgeous lighting enhances the atmosphere of the place making Wagamama’s one of my favourite places to dine in Hampstead. Belsize Kitchen is one of NW3’s most recently found gem. Under the business of our days sometimes we just can’t resist the excellent dishes prepared there. My favourite has to be Brunch with the dish ‘The Gardener’ all the food feels so fresh and homemade. This all adds to its beautiful new furniture, there is a real cosy feeling in this local cafe. The staff are wonderful, and I have enjoyed so many lunches and breakfasts here with the family. Mum and I usually sit there brainstorming whatever is going on for the week, only recently there discussing our storage unit’s front elevation. Belsize Kitchen is a lovely warming café that is perfect for all. Roni’s bakery has the best bagels, it’s the perfect after school or work snack. The café perches up on Roslyn Hill and always catches the most beautiful sun in the mornings, with stunning wooden tables that I feel represent Hampstead in the best possible way. Just as there are over 150 shades of white… yes…150 shades of WHITE. There are just as many colours shades and tones of marble. Varying on region and which mountain it was cut from, no wonder it’s so expensive! You can’t get the real deal anywhere else other than the motherland. Whilst you have your classic shades of white, it also comes in rich greens and reds, warm soft natural beige and brown tones. As well as electrics blues and marbleous pinks. The colours are mesmerising, but no where near as captivating as the patterns that decorate the base palette. Swirling, twirling, wrapping, zipping and zig-zagging, like lighting bolts or tiny flowing rivers, falling off the smooth cut edges like something out of a Dr.Seuss book. There really is nothing like it. Recently featured on our instagram was this photo of a restaurant bar. The natural shape, the deep blues complemented with splashes of white give an water like affect against the brown woods, like the crashing waves of an ocean slapping the side of an old ship. A focal point of our marble fan-girling, is some of the latest from Knoll. 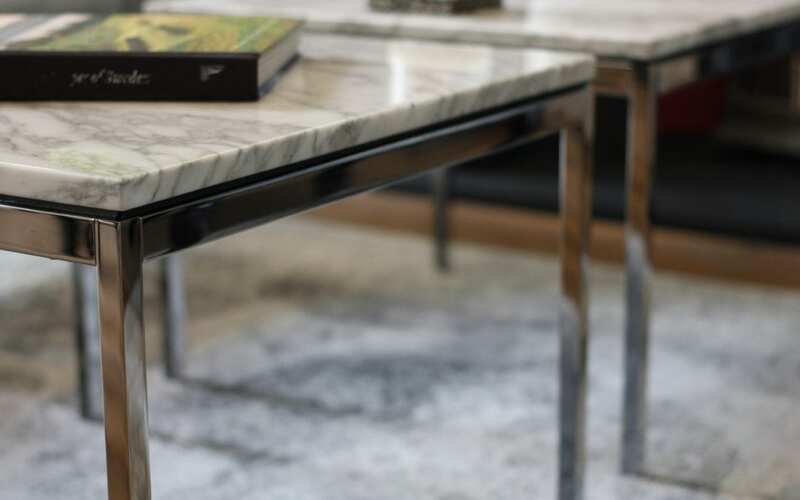 This incredibly rich red marble carries beautiful veins in greens, whites, purples and greys, as seen in our showroom in Hampstead, Belsize Park, NW3. 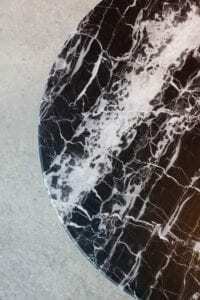 This remarkable marble has the most jaw dropping pattern – We love love love it!! It’s threads of white and grey compliment the black tone and then in it mixes splendid streaks of gold. The veins are just another intricate aspect that shows just how unbelievable mother nature can be. They really add to the wow-factor of this particular piece. However the photos really do it no justice! We fell in love with it originally in the Knoll showroom, showcased on top of a Platner dining table base. This is it in situ! 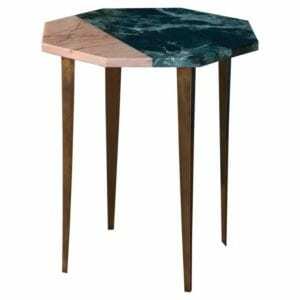 Another marble we’re a little bit obsessed with is pink marble! We love the warmness of the pink hues and there is such a variety to chose from! If you’re a pink marble virgin like us, then you can use the Marble Guide to help you chose colours and discover ones you didn’t even know existed! It looks delicate and extremely feminine. It can be complimented by darker more masculine blues and eccentric gold accents. 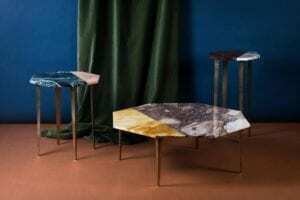 Like these stunning tables from 1st Dibs. 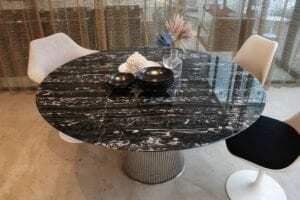 If you want help sourcing a marble table for your home, or if you want to view these marbles at the Knoll showroom, why not give us a ring to discuss what you want. We’re always here to help! Uh oh…make way, make way, another interior obsession coming through…Somebody PLEASE stop us. We can’t stop looking at/wanting/needing/drooling over CANE FURNITURE. .
We know it’s every where and even though we’re only 19 days in, you’re probably sick of seeing it EVERY WHERE. But we’ve jumped on the bandwagon and we just can’t help but be a little bit in love with cane. We know, you’ll love it as much as we do! You just have to see how many amazing cane pieces there are out there in the world waiting to be bought. They’re evidently timeless pieces and must be bought in time for summer evenings, reading books in corners where the sun shines through. Or for ladies lunch or for children picnics. They’re tranquil charm, like an cherished older loved one will forever compliment your interiors. If you need some starting ideas, we’ve chosen a few of our faves to kick start your passion for cane furniture. Ready…? So excuse us while we hunt out what we can steal from our grandparents houses in hopes of finding inspiration items. If not… we’ll just order them directly… you know, because, that’s what we do for a living! Also if in a few weeks you’ve noticed we’re not coming up on your Instagram feed anymore, we’ve rebranded and changed our name Cane Interiors Ltd – so feel free to give us a follow if you love cane as much as we do! If you’re interested in any of the items above for your home, why not contact us to receive a competitive quote. There are so many glorious things to say about Hampstead, but most importantly Belsize Village. Home to NW3 Interiors, my family home and a wonderful thriving community nestled in the North of London. The community built here began many many years ago, long before I got the privilege to move here. We decided on the area… and when I say we I mean I. My husband and I were living in Winchmore Hill and he was absolutely adamant he was going to live there for his entire life. I luckily managed to convince him that moving to Hampstead would be the best decision for us as a new family and that’s how our story with Belsize began. I knew I wanted to have my children grow up in a beautiful area, that was safe, had a variety of places to visit, a close knit community and good schools… not much if you ask me! The idea that I could have all of this in the middle of London meant that we were sold on the idea. It didn’t take long for us to settle in. My children were offered a place at Devonshire House, just a short walk away from our home and I set up my small business NW3 Interiors! The children are lucky to be surrounded by lovely people, beautiful scenery such as the Hampstead Heaths, Primrose Hill and classic english architecture. In Belsize Village we have our go-to places as we believe in supporting local and helping the little guys, after all we’re a little guy and what goes around comes around. I frequently visit Pivoine to get my nails done (she’s amazing and her seasonal window displays are always fabulous! ), I get my dry cleaning done a few doors down at Pyramid and ofter nip into Oliver’s Cafe to admire his incredible artwork (which is usually of Belsize!) or to enjoy a fresh and delicious brunch. My kids favourite shop is the late-late store, filled from front to back with all the necessities for a child, sweets, chocolate and ice cream galore! I thank the lord every day that we managed to get a home in the heart of London with a fairly large garden so that they can come home and run it all off. Thankfully there are the lovely guys at the Crescent Fruiterers who stock up on fresh fruit and veggies as well as providing a large array of seasonal flowers and Christmas trees! The staff are wonderful and are always there ready to great you with a smile, that’s probably why they were chosen to feature in this Winter’s Visa commercial!! My go to place for Belsize Village news and updates is this site dedicated to the area, rightfully titled www.belsizevillage.co.uk It’s full of up to date information about the area, what’s on and what to expect for the upcoming weeks. It’s also features lots of interesting articles about the the history and story of Belsize Park and what makes it so special, including the architecture, art and cultural heritage. One fine gentleman has even made a documentary film about our lovely village – The Belsize Story – watch it here. We know you’ll love our village too, welcome one and all. and in the case of the DK3 Royal System we don’t see a reason as to why we’ll ever take it down. DK3 Royal Storage System has changed our lives since we first laid eyes on it. 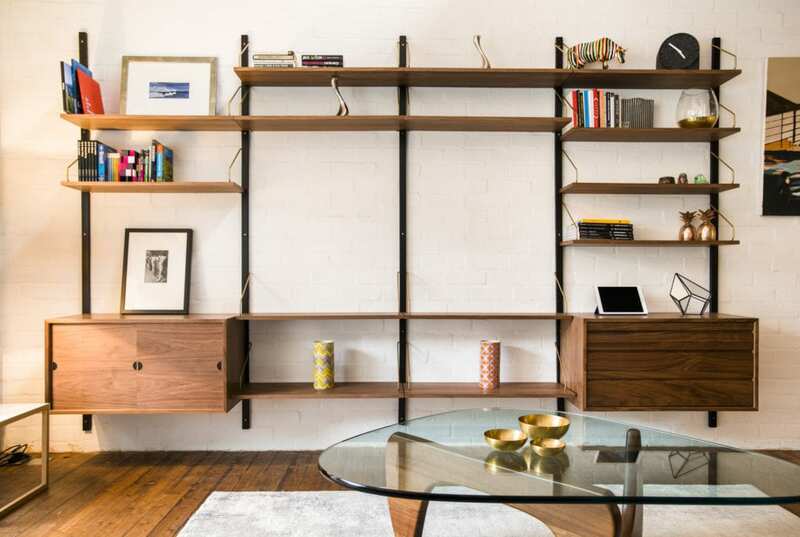 As defined by the original designer Poul Cadovius’ who’s unique shelving system ROYAL SYSTEM® was on everyone’s lips in the 1950s and 60s and was thankfully given a new life by this incredible brand. 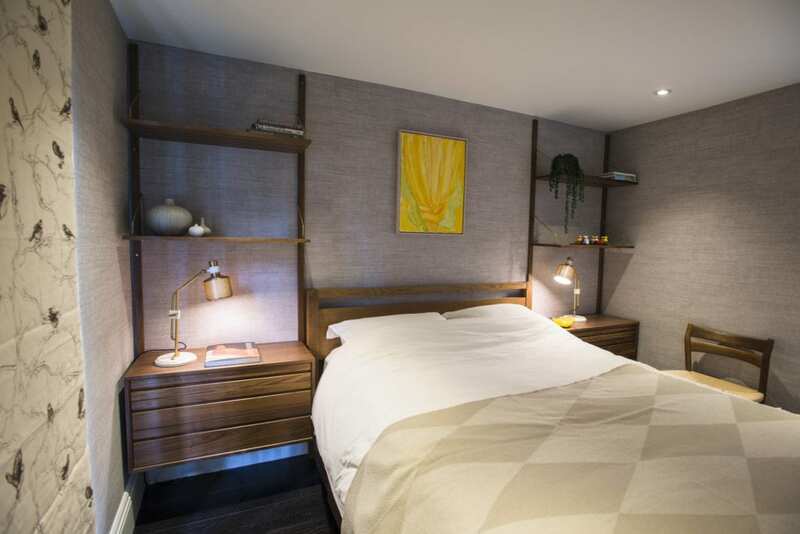 We’ve not only transformed our showroom but also our client’s homes by using the Royal System to change the way they use the space, to add warmth and texture but also to accommodate different types of living requirements. Space to use as a homework desk. Space to facilitate guest luggage and storage space. Space to frame a tv and add personal elements. From large elements and designs, to smaller more compact ones for useful and practical spaces. 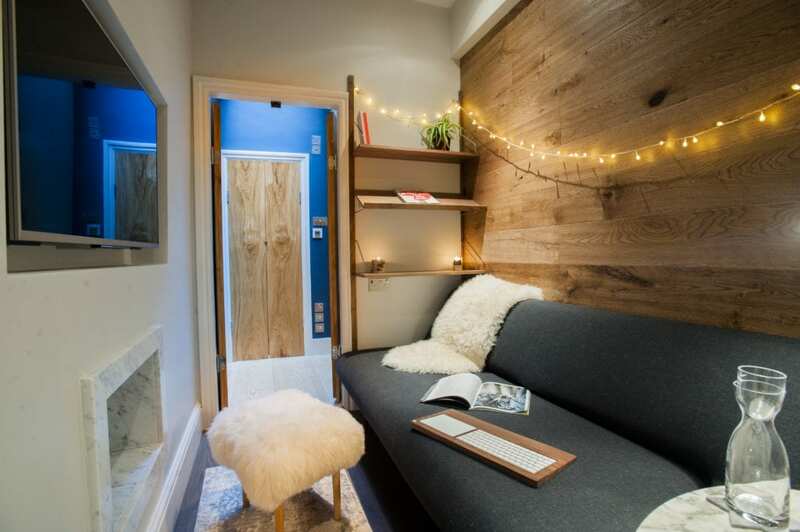 We installed this smaller element in a home in Primrose Hill as a space in a guest room for make-up and for the kids as a desk when they need room and space to study alone. Combined with the conference chair by Knoll we created a lovely addition to this space. If you’re interested in bespoke wall storage, contact one of the team to discuss an initial consultation. Alternatively you can check out more about DK3 here and why we love them and their products.